Catdoodles is here for you to fill its pages with your own drawings of cats, kitties, and kittens in the adorable style of Neko Atsume. Cat lovers unite! Now you can doodle away your days like never-before with of fun prompts for doodling, drawing, and decorating hundreds of kitty cats. Grab your pens, markers, and colored pencils because there are kitties to draw! 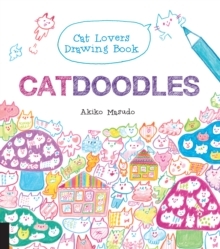 From cat feelings, to cat colors and cat dances, to cats clothing, Catdoodles will never let you down with its fun, creative collection of prompts that will have you drawing in the style of everyone's favorite kitty collecting game, Neko Atume. In no time you'll be hard at work scribbling, doodling, drawing, coloring, and loving this cat-extravaganza.